Have you ever found yourself halfway to work wondering if you closed the garage overhead door? Worse yet, have you ever arrived home at the end of the day to find that your overhead door has been opened the whole time you were away? Incorporating a smart garage door as part of your security solution can help. With TELSCO Connect, you can easily check on your garage overhead door to see if it is opened or closed. Using your smartphone or computer, you can also go ahead and open or close the door with the touch of a button. No more driving back home to close the door, or worrying all day that it has been left open. Being able to open the garage door using your phone is also convenient for receiving packages or granting access to a visitor without giving away a code. On a busy morning, the status of your garage overhead door may be the last thing on your mind. Not to worry. With TELSCO Connect, you can set up automatic notifications and alerts that will let you know if the door has been left open unexpectedly. 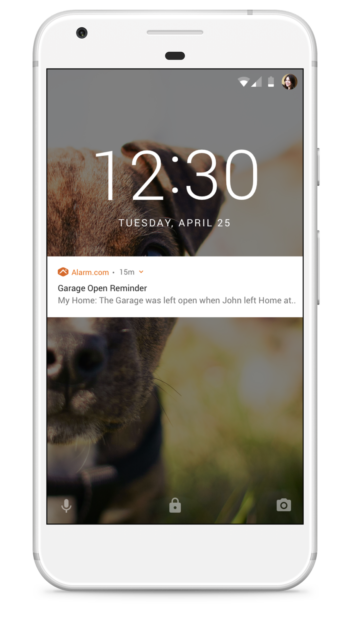 Notifications of an open door can be triggered if the door has been opened too long or even by recognizing that everyone has left home, using Geo-Services location-based technology. Ready to find out more about adding a smart garage door opener to your security solution? Contact TELSCO today to arrange a free home consultation.